Product #1719 | SKU 269HDBU | 0.0 (no ratings yet) Thanks for your rating! 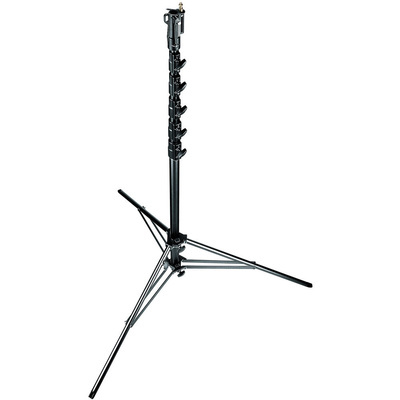 The Manfroto Super High Black Anodised Aluminium Stand is one of the tallest stands available. It will support a maximum load of 10 kg. At its maximum height, it will support a load of 1 kg without additional bracing or sandbags. This light stand features an independently adjustable leg, which can be extended to level the light stand on uneven terrain or stairs. This stand is also available with a chrome steel finish.